At A Loss Recordings is ready to announce two vinyl releases for the fall from Floridian sludge metal duo DARK CASTLE. 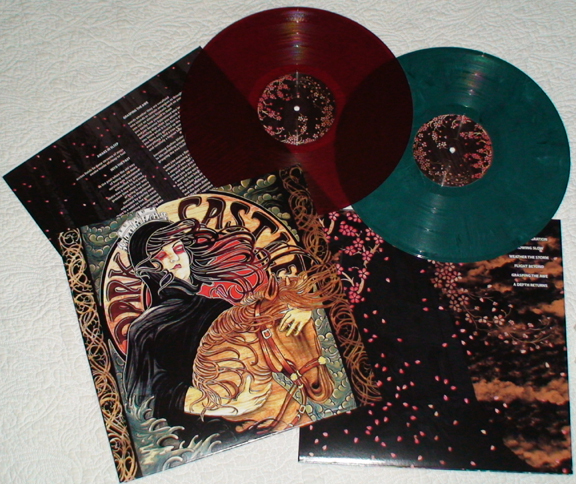 First up, the vinyl edition of DARK CASTLE's critically acclaimed 2009 full-length 'Spirited Migration', which the band has been touring on almost constantly for the past two years. This already behemoth album will be available to the public in massive 180-gram vinyl, the first pressing coming in both opaque ruby red and opaque forest green vinyl. The platters will be available to the public this October 26th, but are shipping via AAL mailorder now. View a photo of the beautiful finished product HERE. The next release from DARK CASTLE will also be on wax, in the form of 'Guardian Of Fire'; a one-sided LP bearing the 21+ minute song 'Guardian Of Fire' track on one side, and a complex etching on the B-side. The track was initially recorded before the 'Spirited Migration' sessions but was never finalized or released. Recently the band unearthed the track, took it to engineering magician Sanford Parker (Minsk, Nachtmystium, Rwake) to remix and finalize the track, with Parker contributing some moog and effects to the final version as well. The LP will be available sometime in early 2011; a final release date and album artwork by vocalist/guitarist Stevie Floyd will be announced/posted shortly. DARK CASTLE have basically become a household name for devotees of crushing, cerebral sludge and organic slow-motion metal due to their incessant touring across North America and Europe alongside Black Cobra, Zoroaster, Nachtmystium, Black Tusk, The Body, Minsk, Battlefields, Samothrace, Howl and countless more over the past several years. The intoxicating, pentatonic flow of DARK CASTLE's unique, thunderous attack offers more than the typical "sludge act" and their live shows are as visually entertaining as they are sonically devastating. Check out live footage of the band's recent jaunt across North America with Nachtmystium, Zoroaster and The Atlas Moth and more HERE. Stay tuned for more DARK CASTLE news and updates over the coming months.